It’s not often that I write about new documentaries. The trends in our genre are clearly cut today. The experimental and groundbreaking works still exist, but are largely relegated to museums and the internet.That said, the film I want to discuss is not really “new.” It’s just finally being re-released. 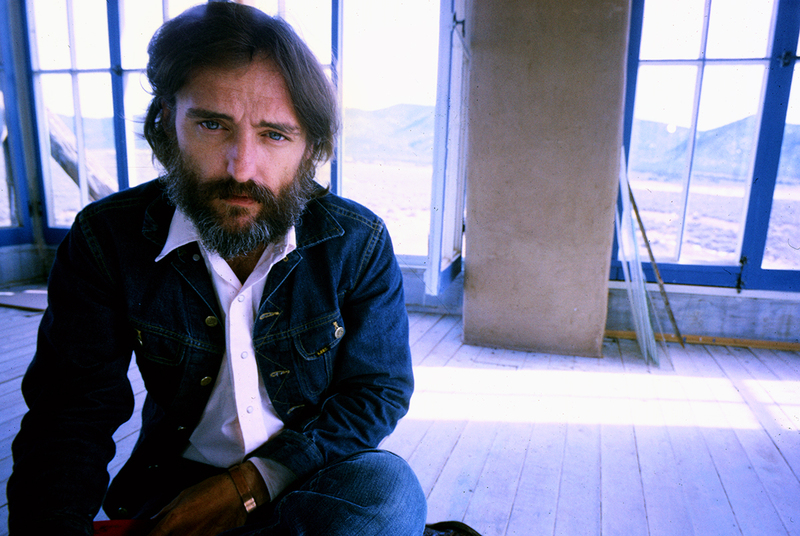 It’s called The American Dreamer and it covers that fateful time in Dennis Hopper’s life, after he made his masterpiece, Easy Rider and was in post on his next film, The Last Movie with editing taking place at his compound in the desert. The American Dreamer was directed by the late L.M. Kit Carson and Lawrence Schiller; two masters of different stripes. Personally, I am schooled on Hopper’s work and there is a reason for it. I was attached to star in a film with him around 2000. It was an extremely compelling, original drama set in the 1950’s in the midwest. It had all of the required festival “it” qualities and likely would have found it’s way to winning major awards. But instead it went sideways. The director, earlier, had attached an Academy Award winning actress to the film. What he didn’t know is that she would manipulate both investors and the director himself. So much so, that he ended up cutting Hopper and other cast members (including myself) from the film. All this before a single frame was shot. I’d give you the name of the film, but it doesn’t deserve the publicity! Hopper and I are both from Kansas, both film junkies, both grew up with a desire to be artists, artists who defined our selves, ourselves. We’re from a completely different era, but the similarities remain. Because of this, and my respect for his work, I’ve become a bit of a Hopper-phile. Hopper was a visionary storyteller. Listening to him in The American Dreamer gives you a look into his psyche, which although it is bred from mid-century mid-America, resonates with a wide variety of people to this day. Hopper could read the cultural zeitgeist very well; in fact he was so adept that he indeed was one of the contributors, the creators of the zeitgeist of the moment. The real genius of The American Dreamer includes a couple of key moments where Hopper grows tense and angered at the director and the scene turns into a tense argument, where Hopper switches his gaze between the camera and the director, telling him just how much he doesn’t like being the subject of his documentary. Although Hopper was an accomplished actor and photographer who understood clearly the roles of the observer and the observed, he was not accustomed to being “the subject” of a verité documentary at that point in his life. Paparazzi existed I’m sure, but were much less technologically-enabled than they are today and at this point in his career had not become ubiquitous. On top of that, he was working with a first time documentary director in Lawrence Schiller. Authenticity is a problem for most young actors, because frankly, they do not know which version of themselves is authentic. They haven’t had the chance to find who they are set apart from their characters and their ego (desire for attention). All too often they even become victims of their egos. One could argue that Hopper was nearly 35 when all of this happened, but he was a young 35, one who’d had sporadic success as an actor for a decade before reaching this creative apex. He was also in the beginnings of an alcohol and drug addiction that lasted for 15 years. Addiction stunts one’s ability to, erm, find oneself. Schiller admits that this film was basically his film school. So many of the odd moments, which play as kitschy and fun today, were the result of Schiller making up shots just for the doc. To that extent (and Hopper’s “playing to camera”) this couldn’t truly be called a verité doc in it’s original form. What Schiller has said about the film is that “this is a portrait of Larry Schiller.” It doesn’t feel that way when you watch it, but if you consider Hopper’s reactions to Schiller in the film, you’ll know what he meant. As the film has aged though, in context, it does feel relevant and honest. Id’ swear it was edited recently if I didn’t know better. But there is no traditional narrative here, which is appreciated. The biggest oddities are Schiller’s apparent intrusion into Hopper’s compound one night, full of young women who weren’t used to cameras and [sometimes] clearly weren’t comfortable or were annoyed by his presence. Personally, I’m glad someone was there to document this ride with Hopper and take in this portrait of his day to day at the time. Schiller had a knack for being there “at the right place at the right time” in his previous career as a photojournalist. His skill set served him well on this film. Hopper apparently wanted the film either screened alongside The Last Movie (or on college campuses) and therefore the film largely collected dust until his passing 6 years ago. If you get the chance, see it in theaters or on Mubi.com while it’s available.